Elon Musk says there’s a good chance he may one day live on Mars. In fact, he’s setting the odds at 70% he ’ll eventually make the move to the Red Planet. In a recent interview with Axios for HBO, the Tesla and Space X founder was asked how likely he thought it would be that he would go to Mars. He put the odds at 70% and then took things a step further to clarify that he saw himself living on the planet, not just visiting. I, myself, am moving to the dark side of the moon, with the Easter Bunny and Mr. Ed. Space excites me. My dream is to go to space. I never read a single book as a child. I did not read as a child. I worked on the farm. I had books in the classroom, but that was it. I never read a single book outside of the classroom. Alexei Arkhipovich Leonov was the first man to walk in space, 18 March 1965. Ellen Ochoa is a former astronaut and current Director of the Johnson Space Center. 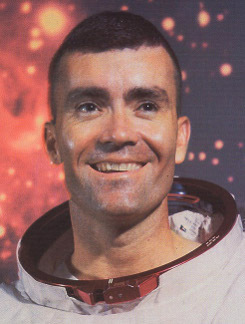 James Irwin was the eighth man to walk on the moon. He left NASA in 1972 and founded the High Flight Foundation. Irwin spent his last 20 years as a "Goodwill Ambassador for the Prince of Peace", stating that "Jesus walking on the earth is more important than man walking on the moon". The moon is bland in color. I call it shades of gray. You know, the only color we see is what we bring or the Earth, which is looking down upon us all the time. And to find orange soil on the moon was a surprise. I believe that these extra-terrestrial vehicles and their crews are visiting this planet from other planets. Most astronauts were reluctant to discuss UFOs. I was testing a P-51 fighter in Minneapolis when I spotted this object. I was at about 10,000 feet on a nice, bright, sunny afternoon. I thought the object was a kite, then realized that no kite is gonna [sic] fly that high. As I got closer, it looked like a weather balloon, gray and about three feet in diameter. But as soon as I got behind the darn thing, it didn't look like a balloon anymore. It looked like a saucer, a disc. About that same time, I realized that it was suddenly going away from me - and there I was, running at about 300 miles an hour. I tracked it for a little while, and then all of sudden the damn thing just took off. It pulled about a 45-degree climbing turn and accelerated and just flat disappeared. What are you going to do with astronauts who first reach the surface of Mars and then turn around and rocket back home-ward? What are they going to do, write their memoirs? Would they go again? Having them repeat the voyage, in my view, is dim-witted. Why don't they stay there on Mars? I could stay out here all day. I grew up on Buck Rodgers and Flash Gordon. There wasn't a space program or NASA when I was a kid. Sally Ride was not the first woman in space. Not even close. Soviet cosmonaut Valentina Tereshkova got there in 1963, a full 20 years before Ride. Yang Liwei was China's first citizen in space. His launch into orbit aboard Shenzhou-5 on 15 October 2003 marked the entry of China into an elite group, consisting only of Russia and the United States, who had the capability to launch human beings off the planet. Yang's name therefore was placed in history next to those of Yuri Gagarin and Alan Shepard. Alexei Arkhipovich Leonov was the first man to walk in space.